HARMONI is a visible and near-infrared (0.47 to 2.45 µm) integral field spectrograph, providing the ELT’s core spectroscopic capability, over a range of resolving powers from R~500 to R~20000. The instrument provides simultaneous spectra of ∼32000 spaxels. HARMONI provides a range of spatial pixel (spaxel) scales, which permit the user to optimally configure the instrument for a wide range of science programs, from ultra-sensitive to diffraction limited, spatially resolved, physical, chemical and kinematic studies of astrophysical sources. The coarsest scale (with spaxels of 0.03″ × 0.06″) provides a 6.5″ × 9″ FoV, well suited to seeing limited observations, and the finest scale a factor of 15 finer (4 × 4 milli-arcseconds / spaxel), Nyquist sampling the diffraction limit of the ELT at near-infrared wavelengths. With its large range of spaxel scales, HARMONI can easily adapt to any flavour of adaptive optics — indeed it is designed to work with LTAO and SCAO, or even with no AO at all! HARMONI is conceived as a workhorse instrument, addressing many of the key ELT science cases. 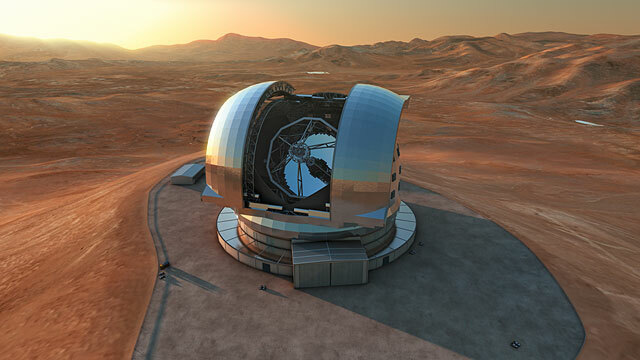 It will exploit the ELT’s scientific niche in its early years, starting at first light. At close-to-diffraction limited scales, it will capitalise on the D4 sensitivity gains of the ELT, providing unprecedented gains in sensitivity and spatial resolution, which when put together, will transform the landscape in observational visible and near-infrared astronomy. Even in seeing limited conditions (or when AO cannot be used to provide high Strehl ratios), HARMONI provides impressive gains with respect to the current generation of VLT instruments, e.g. a gain of ~20 in speed relative to MUSE at the ESO-VLT. Its high throughput (35% average) will ensure that scientists can make the most of the precious photons collected by the enormous collecting area of the ELT. HARMONI will have a high complementarity and synergy with ALMA and JWST, with similar angular resolution to the former, and comparable sensitivity to the latter. HARMONI is conceptually simple (for a 39 m telescope instrument), and will be easy to calibrate and operate, providing the ELT with a “point and stare” spectroscopic capability. Although the size and mass of the instrument make it challenging to realise, it is based on a proven concept, and requires no significant R&D before it can be built.